Private Elegant Waterfront Home, 4 Acres, Views! Fam Friendly! 4000 square foot river front log home elegantly expanded and updated, on three acres of woods with rolling fields and stone walls down to private waterfront with sunset view beyond the river. Huge living room with picture windows and stone fireplace. Large master suite with jacuzzi tub in bathroom and dressing area with sink and walk-in closet. Equally large kids' room with two bunk beds and bath with shower. Separate area with two guest bedrooms and two full bathrooms. Cozy media room for reading, music or watching 42' HD TV via satellite. DSL and printer, washer and dryer. Full dining room. Fully equipped kitchen with dishwasher and disposal. Screen porch with furniture for breakfasts with view of the lake, or summer dinners on the grill. Large deck with incredible view of the Connecticut River and sunsets. Total privacy yet three minute walk to community center with sandy beach, bath house and club house (with ping pong, foosball, kitchen and bath for community use.) Beach use includes use of canoes and sunfish for boating and fishing. Adjacent to beach are two clay tennis courts, basketball, volleyball and tether ball areas. 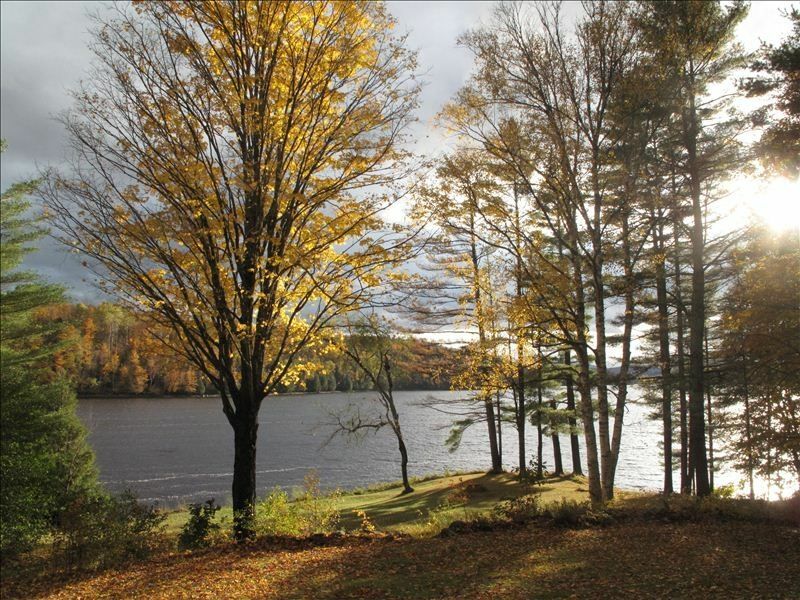 Community consists of approximately thirty vacation homes with six hundred acres, hiking trails, beaver pond and caretaker. Twenty minutes from historic St Johnsbury VT, with natural history museum and athenaeum and twenty minutes from Littleton, NH. One hour from Mt Washington, and children's attractions, including Six-gun City, Whale's Tale water park and Santa's Village . Two hours, forty minutes from Boston, two hours from Burlington, VT.
Keywords: cabin, house, home, Vermont, private, secluded, woods, forest, waterfront, views, lake, riverfront, river, family friendly, kids, peaceful. We are a family of four (with two grown daughters) now spread between California and Florida, though we raised our children in Boston with summers in our Vermont house. Having retired to Florida, the house does not get as much use, and we decided it was time to share our special home on the Connecticut River with others! Within easy reach of Boston, the setting was perfect for a peaceful weekend out of the city. With small children, the ability to let them roam the woods and river was priceless, while the river sports, hiking and tennis proved relaxing for adults as well. A morning swim in the river, when the water is like glass and the birds are out, followed by coffee on the porch, is the perfect summer morning. Foliage season is spectacular in this area, with the woods surrounding the house ablaze with color. Crisp morning hikes with leaves underfoot is a fall treat - try to take in the fall colors from the lookout point at the top of Chamberlin Mt, a 45 minute hike you can start from the front door! There is a screen porch on the side of the house with a full size table for enjoying dinner outside, and another porch runs the length of the house on the river side, with a picnic table and table and chairs. 5 minute walk to clay tennis courts, sandy beach with dock, beautiful hiking trails through woods to mountains, ponds, bogs and river, ping pong table. Large front deck overlooking views of the mountains and river. Full screen porch with outdoor furniture and BBQ grill, perfect for outdoor summer dining. Have a wonderful vacation in Vermont. This home and community was perfect for our family vacation. My only complaint is no screen door on the patio door. Would have been nice to open it up for some fresh air in the living room with the hot afternoon sun. Other than that, it was great. Thanks so much, made more great family memories. Peaceful, relaxing, quiet with plenty to do! In addition to the spacious home, we enjoyed the amenities of the community including the beach (complete with chairs and a floating dock) and the community center (my almost 3 year loved the foosball). And the best part was that it was a quick, easy walk through the woods! We hope to return! Thank you for sharing your home, Liz! This vacation home was absolutely wonderful. There was plenty of room for 6 adults and the views were astounding. Very peaceful and quiet. We couldn't have asked for a better week off from reality! Only thing missing was a screen on the door leading to the porch. A good time was had by all. The view was amazing, the beach perfect. Much fun paddleboarding and sailing. The home worked well for our family, Heartily recommended, and would return for sure. We are so glad you enjoyed our home! There is usually a screen door to the porch - we removed it to have it re-screened and should be installing it again shortly! Seven of us rented the house while on a foliage vacation. This was the perfect house for us. Plenty of room and very comfortable. Off the beaten path it was a very quiet retreat. The scenery was spectacular! The trees were in full color and the view from the deck was breathtaking. We enjoyed our stay very much. House was clean and well stocked for our needs. Would highly recommend to anyone.